Take a seat and meditate with Dhyanse every Monday evening 7-8 pm in Basel city! Drop-in sessions with a short introduction, guided meditation, silent sitting and Q&A. Who is leading the session? Dhyanse is the founder of Meditation Easy App, author of the book ’10 Bulls of Meditation’ and has 10000+ hours of silent meditation experience. In his contemporary approach to mindfulness & meditation, he offers yogic tools, meditation techniques and transformative lifestyle designs to integrate silence and awareness in daily life. He brings the core essence of ancient Indian wisdom traditions of Yoga, Tantra, Zen into his approach, without following any particular belief system. We started these meditation sessions in January 2018 in Basel, since then we have quickly grown as a community of 300+ meditators joining these sessions regularly. Standard Cushions and chairs are available for Free. Choiceless Awareness Guided Meditation Technique for More Time is the full video of a guided meditation session with Dhyanse in Basel, Switzerland held on 17 December 2018. Today we start off with a time travel visualisation experiment. Join me and see what you experience. We did this to understand what time is and our relationship with time. Our relationship with the dimension of time can be stressful, and we can call this psychological time. Psychological time is different for each individual. For example, my one hour is different to your one hour - your experience of that hour is a function of how your mind is projecting it. There are lots of factors causing this, the first could be your own desires and wishes. If you’re enjoying something, then time can fly by. If you’re bored, then time can creep by slowly. The same amount of time can have a different perception or experience, simply because your mind is getting in the way and creating a perceived time. Another factor is your awareness - what your mind tries to do is to put everything from your awareness into autopilot. Time goes by so quickly now as an adult, as you’ve put everything on autopilot. Awareness becomes less and less and you let the moments pass. Hence, your sense of time is completely distorted. What does meditation have to do with all of this? Meditation is that process where you come out of this perceived time, out of this distortion of chronological time and changing that so that you can once again take charge. What is choicelessness? It’s when you let everything, the flow of life, be. You let everything happen, not trying to change anything, not trying to impose your own desires or wishes. Remaining in the moment, without touching the moment. Awareness is when you are more silent, settled and centred, and you’re simply aware of the moment. Meditation is about being choiceless and aware. When you subject yourself to this process, it sorts out this perceived sense of time. It puts time back into its own place and it doesn’t become a reason for your anxiety or stress. In today’s meditation we’re going to try and sit in this choiceless awareness. We’re going to draw our energy from all of our five senses and put them, one-by-one, to our navel centre. This is so that our senses won’t disturb us. When we do this, we’ll be situated in this choiceless awareness. Once we stay longer in this moment, we’ll see that this centre where we’ve drawn this energy, will start to dissolve and go away. What is left is you in silence, in choiceless awareness. Enjoy this meditation to become more in tune with the time you have in your life. 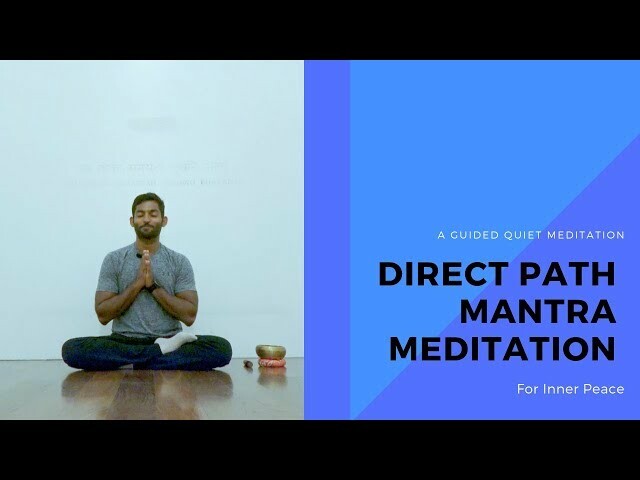 Direct Path Mantra Meditation for Inner Peace: A Guided Quiet Meditation is the full video of a guided meditation session with Dhyanse in Basel, Switzerland held on 26 November 2018. In this session, we seek inner peace by being quiet. When we are quiet, the mind and the body will follow. We will use a mantra to help reach this state of quiet. Inner peace is right here. You just need to be quiet. Who is staying quiet? Is it the body, is it the mind, or is it something else? You stay quiet, not your mind, not your body, just you. The mind and the body will then follow. Trying to get the mind and the body to stay quiet in order to reach inner peace can be a long journey. A shorter journey is simply to stay quiet yourself. What does it mean to stay quiet? It means that when the body or the mind are asking for your attention, you do not give them attention - you don’t involve yourself in the process. You remain indifferent. That’s where you reach inner peace directly. When you remain quiet like this, what happens as a consequence is that your body and mind start to follow you. There is one way of achieving inner peace, which is an indirect path in meditation where we learn different techniques to help to silence and relax the mind and body. In this session, we are going to do a more direct way of meditation, that is - starting with you being quiet, being silent. When you remain silent, your mind from the beginning will try to distract you and take your awareness. If you do not give it attention though, your mind will keep coming to you and eventually it will realise you’re being quiet and will also start to be quiet. It won’t disturb you any further. The same is with the body: when you sit in meditation, your body might start to bother you trying to vye for your attention. If you learn not to get involved with it, and still remain quiet, your body will stop asking for your attention and will follow your core. If your core is at silence, your mind and body will slowly follow. When your silence concentrates and becomes heavy and alive, your awareness arises out of it and you can see your mind and body at a distance. This gap allows you to not get involved with the mind or body - it’s a natural stability and centeredness that you experience as you remain quiet. Whilst you exhale, you will repeat mentally - like a mantra - that you will take a vow of silence: eg. “I will remain silent, I will remain quiet”. You will repeat this as you continue exhaling, fully out of your lungs to a point where there is absolutely no breath left in your system. Even in that moment, keep repeating your mantra. When you do that, it goes very deep into your system. If you do it sincerely, it will go so deep in your system that you will remain quiet for the meditation no matter the distractions, noises or interferences trying to get involved. There will be minimal guidance from me throughout this meditation, to allow your silence to grow within. What we tried today was the direct way of entering meditation. Keep working on this technique, especially if you feel it doesn’t happen for you today. A tip for the future - stop working on your mind, and your body. Just work on yourself and being quiet. It’s so simple, without any formula or technique to it. Give this a try, where you’re not working on the mind, just you staying quiet, and see what happens. “How to Use Aloneness in Meditation to Center and Ground Yourself” is the full video of a guided meditation session with Dhyanse in Basel, Switzerland held on 15th October 2018. In this session, we explore the concept of aloneness, and how you can recognise and reap the benefits via meditation. My intention to share this meditation today is just to encourage you to sit down and always come back to your center, to your aloneness, where there is nobody else, where there is no object, no person, no movement, no content - except for you. As long as you are in yourself, it is enough. Someone asked a Zen Master - what is the greatest miracle in this world? The Zen Master said “I’m here alone with myself”. What I want you to do in today’s meditation, is make the assumption that you are here alone. Why this assumption? Because if you go into yourself, if you go into the truth of things, you are always alone. This is a realisation which those who go into their self, go into their meditation, go into their inner depths, they come to this as a realisation. You will also come to this realisation at some point in time during your meditation practice, and that is something we want to familiarise ourselves with in this session. What does it mean, and when you come across this state in your meditation journey, you will be more familiar with what it means. What is this aloneness that I’m talking about? I’m not talking about loneliness. Loneliness is when you’re missing something. In loneliness, there is something missing, you’re always looking outside, trying to fill a certain gap in yourself. Aloneness is when you are not missing anything. In aloneness, you are complete. In loneliness there is fear, there is darkness. In aloneness, there is no fear, no darkness, only yourself, your being, and your presence. We are constantly finding distractions to take our attention away from ourselves. This is something trained within us since birth - running away from our own self, our own aloneness. This aloneness is so beautiful, it’s not that you’re not able to relate to other people. It simply means that when you are with yourself, in your center, 100% in your aloneness. The subtle difference between loneliness and aloneness is something that needs to be understood and in the context of meditation - brought into practice because at some point of time in your meditation journey, you will come across the fact that you are always alone. What does this mean in terms of our meditation today? In this session we will practice meditation which will allow us to emphasize more on this aloneness, this centeredness, this presence that we call as pure being, we call ourselves. In this entire session try to focus just on your aloneness, and go as deep as possible. Shift your awareness back to yourself. Firstly, we’ll become aware of anything distracting us and put it aside, bringing our focus back to ourselves, to our aloneness. Secondly, we will anchor that aloneness on our breath, so that we stabilize in this centeredness of our own self. Once we have done that, we will even leave the awareness, or this anchor of the breath, and just stay aware of ourselves, of our aloneness, of our pure being. It’s a very simple, silent meditation. Not much guidance is needed, but I will give you some cues throughout the meditation so that you can focus on yourself more than anything. In today’s session, we will sit a bit longer in meditation than we have previously, so be sure to sit in a comfortable posture, something that allows your mind to let go and focus on yourself. That would be my wish for you, wherever you are, if you feel that you are in your center, you are here - then that is enough. Let’s try and achieve this via our meditation practice. 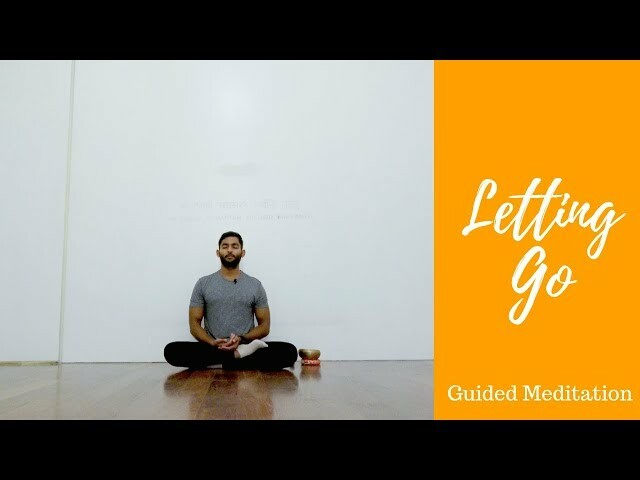 Using Meditation to Let Go is the full video of a guided meditation session with me Dhyanse in Basel, Switzerland held on 17th September 2018. The theme of today’s meditation session is letting go. In this session, I give you the opportunity to do some reflection about your life. There are two ways we can learn how to let go: the hard way, learning via the experiences of life; and the other way is via meditation. I will guide you through each of the steps of letting go. Think of something in your life you might like to let go, and use that as a focal point for this meditation. We want to drive our life in one way or another, and when we can’t for whatever reason - we experience difficulty. We can’t let go. Nobody teaches us how to let go. The concept of letting go is left for us to figure out. In this meditation, I help to throw a spotlight on how meditation can help you to let go of things you cannot control in your life. Letting go of the body, relaxing the body and letting the body be the way it is. Letting go of the mind. Allow yourself to sit in silence and observe the bazaar of the mind. Letting go of the I. This is the deepest “let go” that is - that of the ego, your own self, of the observer - the same observer who is letting go of the body and the mind. Once you can let go of the I, you can experience bliss. During this meditation, see what it feels like to let go of one or all of these three things. I will guide you through each of these steps, starting with the body, then the mind, then the I; and then finally to the silence. Letting go is meditation, and meditation is letting go. Join us in this process and see how far you can go.